One of the many reasons I wish President Obama would live up to his promises and close Guantanamo Bay is that I hate trying to photograph those bright, often fluorescent, orange jump suits which have become such a part of the protest vocabularly. Of course its a very minor reason compared to the torture and human rights abuse, but one that gives me a certain amount of personal grief rather than engaging my conscience and my empathy for the suffering of others. Bright reds and oranges have long been a particular problem for photographers, and it was certainly something I came across in the days of film – but then almost all colours were a problem with film, at least if you had any concern for accurate reproduction. Which is something many photographers don’t suffer from, and why so many long for the days of Kodachrome or wax long if not eloquent about the warmth of Agfa, or even pine for the garish purples of Orwo. And why so many Fuji X users are excited about the new firmware that adds ‘Classic Chrome’ to the various distortions you can – if so inclined – give your colour images. But though I generally love digital colour, or at least Nikon’s version of it (and Fuji X is usually great too) there are still a few problems. Artificial light, often far removed from a continuous spectrum has its own problems, and just occasionally in natural light there are conditions where I can’t really get entirely satisfactory colour results. And there are bright oranges. 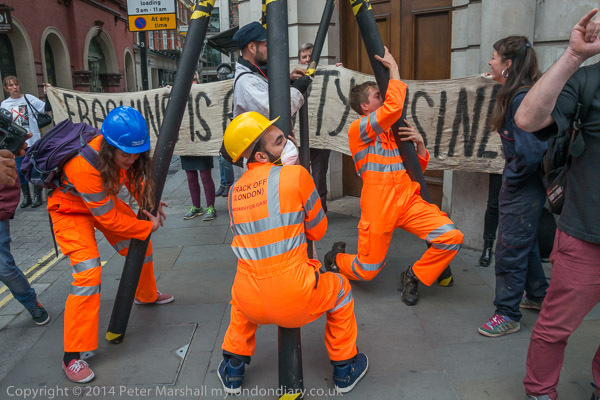 So while I expect problems at protests for the release of Shaker Aamer, a Londoner still held in Guantanamo to the shame of both US and UK governments, I didn’t expect to have to deal with the same problem when I went along to y Frack Off London’d Global Frackdown event. 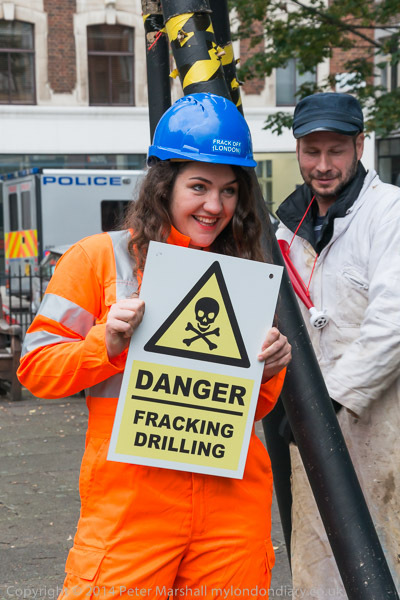 But I arrived to find their fracking rig workers in bright orange suits. The files on My London Diary were processed rapidly in Lightroom before uploading them for possible publication, and I didn’t have time to think about the orange suits. I’ve done another rather quick edit (with some slightly careless burning in) which gives a rather better result to the suit, though still not entirely to my satisfaction. Apart from darkening and lightening some areas, the main change is a switch from the Adobe Standard profile I normally use to ‘Camera Portrait’ for this image made on the D800E with the 18-105mm. For images made using the D700, I have a wider choice of profiles available in Lightroom. Changing from ‘Adobe Standard’ to ‘Camera Neutral dcpTool untwist’ with just some minor adjustments to contrast and exposure – but no burning in – gives a better result, and corrects the slight hue shift in the original oranges. I’m sure it would be possible to get a similar profile for the D800E, but I haven’t bothered to do so yet. For almost all pictures the ‘Adobe Standard’ is fine. 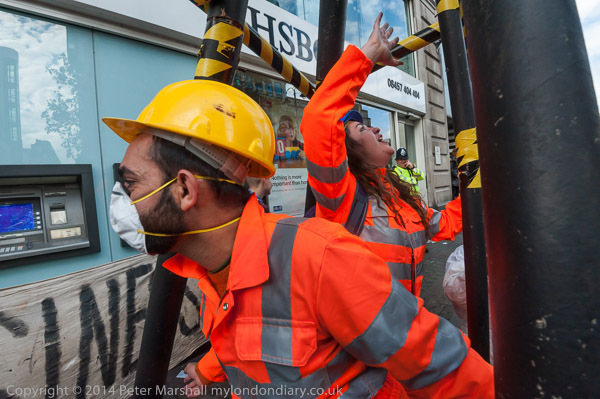 You can read about the protest and see more images from it at Global Frackdown at HSBC. Since writing this I did a quick web search and found a link to some useful D800/D800E profiles. This entry was posted on Tuesday, December 23rd, 2014 at 05:47 pm and is filed under My Own Work, Technical. You can follow any responses to this entry through the RSS 2.0 feed. You can leave a response, or trackback from your own site.